Ready for this? An admission-free T-shirt Festival is coming to Yomitan on Saturday and Sunday. Everyone has T-shirts. Everyone wears T-shirts. They’re so easy and relaxing because T-shirts are made from the most popular fabrics, a perfect fit for Okinawa’s hot weather. In Yomitan Village in Okinawa, the most populated village in Japan, The T-shirt Festival at Ikoi no Hiroba, Ti-da 33 in Yomitan runs both days 10 a.m. ~ 9 p.m.
A variety of T-shirts gathered from local people and companies will be displayed in public, just like hanging out laundry outdoors under the sun. A competition of original T-shirts solicited from the public will also be staged. Festival organizers say ‘Rediscover the T-shirt’s attraction’. T-Shirt festival that promises to have designs and colors rarely seen before. The Festival is going to provide various show events of course. One of the highlights is a Heshikiya Eisa performance on Saturday, an event for which there are a lot of fans of its unique, simple and elegant style. 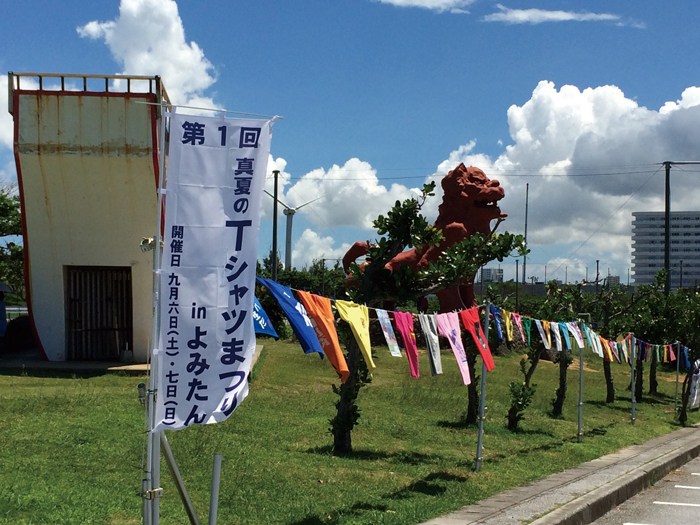 Other than that, organizers are preparing a show by local singer Shigeaki Nishidomari, some dance performances, a comedy show, and a mini motor show. MCs are Taishi Iha, a local popular personality also known as a bullfight live announcer for September 6th, and radio personality, Mari Kudaka for September 7th. Ikoi no Hiroba, ‘Ti-da 33’ in Yomitan is at 1861 Uza,Yomitan-son, Nakagami-gun (http://goo.gl/maps/xvktv). A prize-awards ceremony for competitors starts at 5 p.m. on Sunday.